"...[T]hrough sheer will and determination and the commitment of her three-member cast... Malfitano makes A Florentine Tragedy work, spinning out Wilde's tale of infidelity and betrayal... in often delicious, even stylish fashion and using the twist that ends the tale to score major dramatic points. Under Malfitano's tutelage, [in Gianni Schicchi,] it's not just the era that has been changed in Giovacchino Forzano's libretto, but the comedic underpinnings as well, with an extensive cast... all doing their level best to give the proceedings a sort of Fellini-does-slapstick feel that's probably a lot more buffo than most opera lovers have come to expect. Finally, it all comes together as a memorable Florentine feast." "Director Catherine Malfitano has chosen to set the Zemlinsky in the silent film era and the Puccini in a contemporary setting; both in the same apartment in Florence. It works fine. The Personenregie is well thought out, the acting is good.... It's a fine production and a fine performance but maybe of a work easier to admire than really enjoy. The Puccini is a complete change of mood and pace. It's played here as a fast paced, mad cap comedy, albeit not without a touch of pathos. The apartment is filled with a heap of the dead Buoso Donati's 'stuff' over which the cast clamber in search of the elusive will. There is lots of light and action as the cast scurry around and perform carefully choreographed expressions of shock and surprise. The comic timing is good, the designs just over the top enough and the sigh gags funny without being ridiculous. It's good fun." "[Malfitano's] staging is also refreshingly fluid, counting on her performers to deliver even when she takes away the conventional stand-and-sing comfort of most stagings." "No other way about it: the double bill is excellent. And here's why. It's a production for grown-ups. There's none of the escapism and nostalgia Merchant Ivory nonsense. Though both pieces originally take place in [the] Renaissance, Malfitano has moved the first opera to the time of its creation and the second one to the present. Furthermore, it's a production for grown-ups of our time. Who is paying the bills, where is the money coming from, whose property are we on, and how do these relationships of ownership and dependence affect friendship, love and family ties - to make any kind of art today, anything at all, without the awareness of questions like these would be utter blindness. This production puts them centre-stage. Everything works tickety-boo in all corners of this [Schicchi] production. The ensemble singing and acting would make Christopher Guest envious. You will keep thinking about this double bill long after you left the opera." 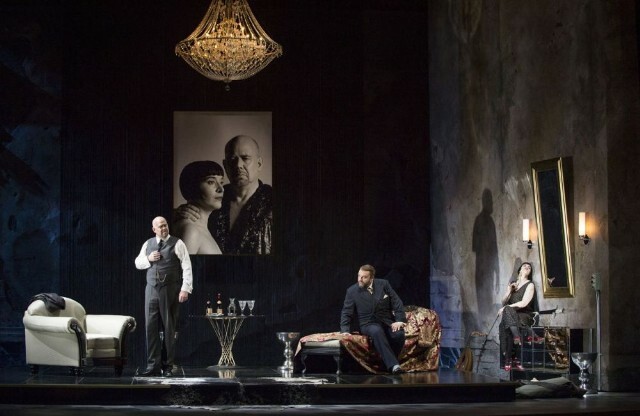 "Last night the COC's latest production premiered to an enthusiastic crowd. The use of language and imagery in A Florentine Tragedy is beautiful, and it really shows off its literary roots. What really works about the Gianni Schicchi is that it has all the charm and silliness of a Looney Tunes short, but it avoids becoming too cartoonish or farcical. The family members are greedy and selfish, but their egos and vanities seem plausible, if amped up for the sake of entertainment. They're painted with a damning but comical brush, and there's a certain amount of tongue-in-cheek that makes their greed and selfishness fun. As the characters move about the stage, their body language and unique costumes communicate just what sort of person they are without singing a note. There's a ton of personality to this opera, and it seems to burst with energy and humour. [Gianni Schicchi is] a funny, well-paced, thoroughly enjoyable show." "Puccini's comic Gianni Schicchi, [is] an opera that can appear unfunny, even tedious, in the wrong hands. I can honestly say this production was the funniest I've seen. Much of the credit of the success goes to two people - soprano turned stage director Catherine Malfitano, and American bass-baritone Alan Held, who takes on the Herculean task of singing both lead roles - Simone and Schicchi. [Malfitano] brings her intensity as a singer to her directing, and it shows that she is equally adept at stage directing." "The COC's new production uses Florence's breathtaking cityscape as the canvas on which Malfitano draws out the themes of class values, morality and excess of riches that underline both operas... Inspired by how A Florentine Tragedy and Gianni Schicchi are linked in time and subject but can feel representative of two very different worlds, Malfitano's concept unites the two operas by having them within the same Italian palazzo but physically sets them in different time periods." "In the hands of singer-turned-director Catherine Malfitano, the operas were brought from the Renaissance to modern times - Zemlinsky's to the 1920s and Puccini's to the present day. Happily they came through the time machine intact, and with value added. Through her updated stagings, Malfitano persuasively argues that human nature hasn't changed much in the last 500 years. Leaving the familiar to the last, the COC opened its double-bill with Zemlinsky's rarely heard A Florentine Tragedy. There are only three characters in the cast - yet... this little triangle is a hornet's nest of emotion. All three singers rose to the occasion, with taut and edgy performances. In Gianni Schicchi... Malfitano's eye for detail and timing made the show run with the zany precision of a Rube Goldberg machine. Adding lustre to this new double bill is the fact that it's a company-built production, not a rental. Congratulations to the COC - this one's a keeper." "Malfitano's comic work [in Schicchi] is devilishly inspired, with her designer Wilson Chin, making the house something right out of Hoarders and providing a final coup de grace of the Florentine skyline that is pure joy. One would like to make this production of Gianni Schicchi available to the widest audience possible because I firmly believe anyone who saw it would love it." "[Catherine] Malfitano's direction is unfussy, focusing on the psychological parrying between adulterers and the cuckolded husband in the drama, and on the messy machinations of a family fighting over a dead man's estate in the comedy." "The combination of Zemlinsky's Eine florentische Tragödie and Puccini's Gianni Schicchi turns out to be a winner, at least in this new production directed by Catherine Malfitano with designs by Wilson Chin (sets) and Terese Wadden (costumes)." "Diva turned-director Catherine Malfitano... linked the two operas by setting them in the same decaying Florentine villa, beautifully designed by Wilson Chin. While the original stories are set in the sixteenth century (Zemlinsky) and the fourteenth (Puccini), Malfitano updated the Zemlinsky to the 1920s and the Puccini to the present so that we moved forward in time through the evening. In both works, Malfitano drew from her performers highly detailed acting, alive to the nuances expressed in both the words and the music. She created a sense of mounting menace in Tragoedie, as if it were a play by Albee or Pinter. In Schicchi, Simone Osborne and René Barbera were clear standouts as the young lovers. Malfitano gave equal weight to Rinuccio's aria in the praise of Schicchi ('Firenze e come un albero fiorito') as she did to Lauretta's famous aria, which helped place the two on a balanced footing. 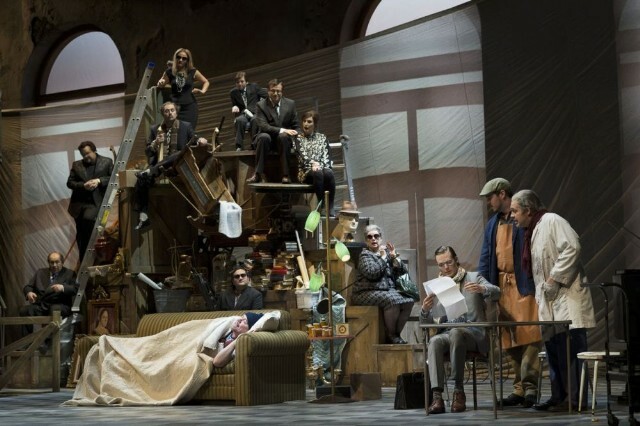 In sum, COC's new double bill was a great success...."
"In Schicchi, [Malfitano] adds numerous comic touches, such as having Buoso die on his sofa-bed at the beginning while the men cheer a soccer goal on television, that make this the funniest Gianni Schicchi I've ever seen. She undercuts the saccharine quality of Lauretta's famous aria "O mio babbino caro" by making clear that Lauretta is consciously using the song to win over Schicchi. When she sees he's give in to her, she gives Rinuccio a secret thumbs-up."